Wildlife Conservation | Wildlife conservation, species protection efforts, and sustainable use. Sad news out of Malaysia. Once a primary habitat for the Sumatran rhino, Dicerorhinus sumatrensis, this country has now been declared void of this magnificent species. I know I have been quiet on this for quite a while, but this is the main point I have tried to get across in past writings about species conservation. The most important part of conservation efforts is to give species real value. If the species is being driven into extinction due to illegal trade often the best way forward is to regain control of that trade and create a real world value for the species other than its value on the black market. When Laws Meant to Save Endangered Animals Hurt Them – Yahoo News. Rarest Big Cat on Earth Starting to Make a Comeback – Yahoo News. Endangered species: scientist discovers the cause of the decline of the technicolour Gouldian finch – ABC Kimberley WA – Australian Broadcasting Corporation. LA Times – Grand Canyon gets surprise visitor — a gray wolf. Another example of how hunters are the greatest force for conservation. 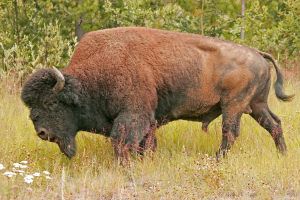 SCI Foundation recently received a $95,000 grant from its Hunter Legacy Fund (HLF) to help reintroduce wood bison into the Innoko National Wildlife Refuge in Alaska. The reintroduction of wood bison has been a long-term goal for many stakeholders in Alaska, Safari Club International and SCI Foundation. After six years of maintaining a herd of wood bison at the Alaska Wildlife Conservation Center (AWCC), and after federal approvals have been obtained under the Endangered Species Act, the bison can finally be released into the wild. This long-term project of multiple organizations can finally be completed. ‘Animal Earth’ – A look at of some of the most unknown and overlooked creatures on the planet.